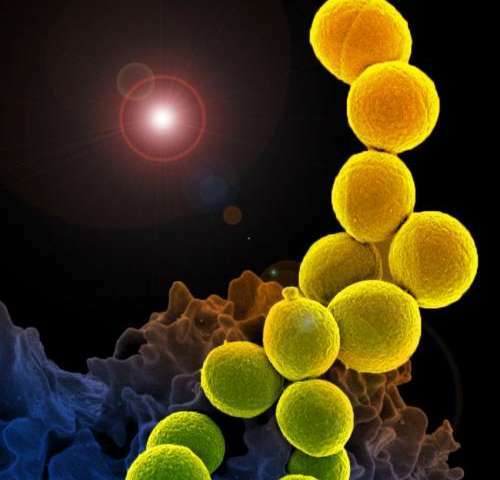 Targeting deadly, drug-resistant bacteria poses a serious challenge to researchers looking for antibiotics that can kill pathogens without causing collateral damage in human cells. A team of Boston College chemists details a new approach using a "warhead" molecule to attack bacteria—and spare healthy human cells—by targeting a pair of lipids found on the surface of deadly germs, according to a report today in the journal Nature Communications. The researchers developed a novel, unnatural amino acid that serves as a suitable molecular warhead to target bacterial pathogens. Gao and his group sent the warhead molecule after bacterial lipids known as amine-presenting lipids—specifically phosphatidylethanolamine (PE) and lysyl phosphatidylglycerol (Lys-PG) - which can be selectively derivatized to form iminoboronates, a covalent bond forming process that allows the selective recognition and labeling of bacterial cells.